Happy November! 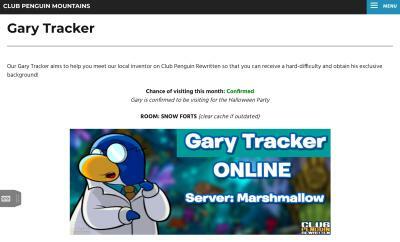 This is just a quick post to let you know that Gary visited today on Club Penguin Rewritten, on the server Blizzard. He was tracked by the tracker. In regards to if he is returning, Gary said he “will most certainly be back soon”, so he’s fairly likely to visit again today. Congratulations if you met him! Last night, I hosted a small (which turned out to be pretty huge!) Halloween event on the server Marshmallow! It was definitely a lot of fun, as we got to visit plenty of rooms, roleplay as ghosts, earn the Trick and Treat stamp and visit eighty different igloos! During the event, I took photos of every igloo we visited, and lots of photos of different spooky outfits! I wanted to make this post to share some of the spookiest costumes and igloos, which was pretty difficult because there were loads of them! In the end though, I was able to select three: masterfrog, Norma97 and somigf all had amazing outfits, and Marrisa, Halopona and Igloo22222 had some incredibly creative and spooky igloos! For those who were able to attend, thank you very much for coming, I had a lot of fun and I hope you did too! I’m sorry if we weren’t able to visit your igloo as well, I tried my best to get to everyone but unfortunately I had to go just after two hours from when the event began. If you weren’t able to attend, don’t worry! This was a lot of fun to hold, and there will probably be more in the future, since they’re very enjoyable! Thank you very much for reading, be sure to check back for more of the latest news and guides! Two new codes have been released on Club Penguin Rewritten, each lasting just one day but unlocking a T-Shirt and some cards! These codes expire in a day, so be sure to redeem them before it’s too late! Thank you very much for reading, waddle on!